WHAT CAUSES LIPID DEPLETION AND DRY BRITTLE SCALY SKIN? 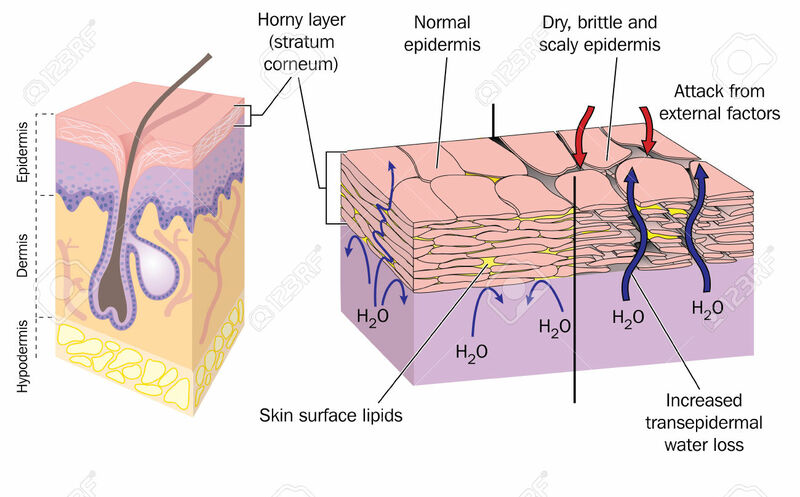 Exposure to the environment and the natural aging process of the skin alone lead to Dry Skin (the loss of oil and water from the epidermis); the depletion of the skin’s fatty acids (“lipids”); and the diminution of the skin’s protective epidermal moisture barrier which keeps moisture in and toxins out. There may be other causes as well: certain serious medical conditions like diabetes and peripheral vascular disease, certain medications like steroids and the use of harsh cleansers. Daily use of a lipid replenishment cream for dry skin like CABOT® P.O.L.® PHOSPHOLIPIDS CREAM a proprietary formula of natural lipids renews the skin’s protective epidermal moisture barrier, thickens the skin, improves its flexibility, moisturizes and softens the skin leaving skin healthier and younger looking. Natural sealing of the epidermal layer – by replenishing depleted skin lipids – protects skin from the assaults of the environment and aging; prevents the entrance of toxic substances in skin; increases the firmness and flexibility of skin; and improves the health and visible appearance of skin. CABOT P.O.L. Phospholipids Cream is formulated to deliver the proven benefits of a complex of phospholipids, glycolipids and ceramides – powerful natural antioxidants and the chief moisturizing agents in the skin, which penetrate the skin to provide long lasting moisturizing and protection and provide safe and effective treatment and protection of thin dry, cracked skin. Phospholipids are the prime building blocks of all forms of life – and thus Phospholipids are indispensable to all forms of life and healthy skin: assembling and strengthening skin cell membranes, stimulating microcirculation and accelerating the natural healing of superficial and serious traumatized skin. P.O.L. Cream and Lotion also deliver two other natural lipids, glycolipids and ceramides, and contains the antioxidant vitamins A and E to protect and promote skin repair. The formulation also combines the healing and soothing properties of Allantoin and Bisabolol, the natural and well tolerated skin emollient, Safflower Oil, to condition the skin and maintain skin moisture; and Dimethicone and Glycerin to protect, condition, and hydrate skin and help reestablish the skin’s natural barrier function. A special ingredient, Saccharomyces ferment provides skin strengthening proteins to the skin. Unique to P.O.L. CREAM is Skin Strengthening Complex. This blend of four essential oils enhances the natural skin strengthening and conditioning properties of the cream. Nurses’ not only recommend P.O.L. Cream, they use it for themselves! Nurses were among the first health care professionals to discover how effective P.O.L.CREAM is and from there, the support from the nursing community has grown stronger and stronger. Dermatologists, podiatrists, gerontologists, and other medical professionals are also strong advocates of P.O.L. CREAM. Nurses know that P.O.L. CREAM is non-medicated and contains no steroids, so patients can use it as often as needed. P.O.L. is the first skin care product in the world formulated with Pure Omental Lipids which deliver phospholipids – powerful antioxidants and protective moisturizers. This proprietary formula protects, moisturizes and promotes healthy skin. I am using Cabot P.O.L. CREAM for dry skin from diabetes. I have used tons of different lotions and creams but they didn’t work. There is no comparison to other products! Cabot P.O.L. CREAM is the best! I love it! I have been using Cabot P.O.L. CREAM for dry skin and skin irritation. P.O.L. relieves pain and itching faster than any other product. I like P.O.L. because it gives me relief when I need it. Phospholipid replacement is an essential element in rebuilding and strengthening of skin. Cabot P.O.L. Cream and Lotion contain the lipids human skin needs to renew itself. These lipids are utilized by the body to rebuild the skin’s barrier function. Protect and renew the skin’s protective barrier function. TAKE CARE OF YOUR BODIES LARGEST ORGAN. “If you’ve been disappointed by anti-aging products that did not deliver, the idea that mature skin can look great and feel great may sound like more hype. Don’t despair. There really are effective products and treatments.” American Academy of Dermatology. The key to healthy skin: moisture and anti oxidants The less moisture that skin has, the more vulnerable it is. The super-moisturizing formula of P.O.L. Cream is steroid-free and antihistamine-free, so you can use it as often as needed. This proprietary formula protects, hydrates, and helps skin to heal itself to create a healthy moisture balance to relieve scaly, cracked, severely dry skin and reduce the visible signs of aging. Apply P.O.L. Cream daily or as needed. For maximum moisturizing benefits, use after bathing. Avoid hot water and harsh cleansers.